In Kenya, the Africa Mental Health Foundation’s TEAM project enlisted African traditional healers, faith healers and community health workers to detect mental illness, and refer cases to clinicians. Referrals of people suspected of having mental illness rose from zero to 1,593. Of these, 494 went on to be clinically diagnosed with a mental health disorder. In rural Pakistan, the “Thinking Healthy” programme screened 4,000 pregnant women and identified 903 as having perinatal depression, a common condition which can affect women before childbirth and lead to further difficulties afterwards if untreated. Following this, 42 community health workers were trained to deliver 16 sessions of an evidence-based “talking therapy” until a year after the women’s babies were born. In Goa, MANAshanti Sudhar Shodh (MANAS), which means “project to promote mental health”, trained non-specialist health workers to deliver psychosocial interventions, including psycho-education, yoga and interpersonal therapy. They ran a trial of 2,796 people with common mental disorders and found 65.9% of those who were treated with a collaborative care approach, including psychosocial interventions recovered after 6 months, compared to just 42.5% in the control group. In the Nashik district of India, the Atmiyata programme is training 15,000 people from self-help groups and farmers clubs, alongside doctors and social workers, to work together to identify mental illness cases in the community. In Zimbabwe, benches have been placed outside health clinics, which people visit for treatment of all kinds of conditions including HIV and AIDS. Lay health workers, known as Golden Ladies or “Grandmothers”, are trained to deliver low-intensity cognitive behaviour therapy to anyone referred to the benches by clinicians. To date, over 15,000 people have used the Friendship bench. The project has already shown promising results, and Grand Challenges Canada is funding its roll-out to 60 clinics in the 3 cities, where it’s hoped up to 50,000 people will have access. 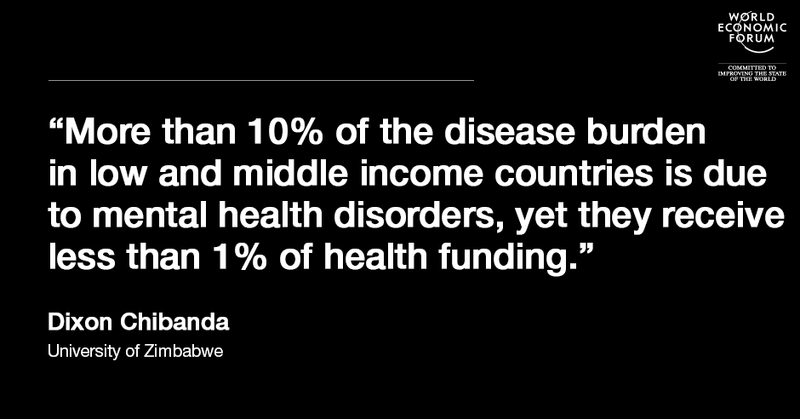 WHO and World Bank’s ‘Out of the Shadows: Making Mental Health a Global Development Priority’ event made a strong case for mental health to move up the global development agenda. Now is the time for LAMIC governments to invest in scaling up cost-efficient, highly effective interventions. The cost of inaction is just too high.